The saga of Ricky Caldwell has come to a close and SILENT NIGHT, DEADLY NIGHT 4: INITIATION starts anew (although there is a homeless character named Ricky, played by Clint Howard, who could very well be Ricky Caldwell). I knew this little tidbit going into SNDN4, but I didn't let it deter me, for I was (am) on a quest to slice my way through the SILENT NIGHT, DEADLY NIGHT franchise. Like my viewing and subsequent rundown of SNDN3, I was only able to obtain a VHS copy of INITIATION. But unlike BETTER WATCH OUT!, this one didn't have embedded subtitles! Yay -- minor victory. The film revolves around a coven of witches, and the initiation process to join the coven. A woman who works for the local news takes it upon herself to investigate the recent the death of a woman who fell from the roof of a building in flames. 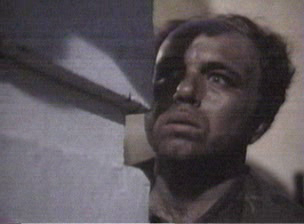 A mysterious homeless guy named Ricky (Clint Howard) -- and I don't believe this is supposed to be the Ricky from SNDN2 -- shows up and is in and out of the entire movie. In all, INITIATION is a very forgettable movie. In fact, after just viewing the film, I've already forgotten a large chunk of the film. That should tell you something. This movie really has no business belonging in the SILENT NIGHT, DEADLY NIGHT series.